For generations, cooks have deemed the cast-iron skillet supreme in the kitchen. And with greater variety of cast-iron cookware today, new generations are discovering the tradition of cooking with cast-iron, ideal for nonstick cooking indoors or out on the grill. 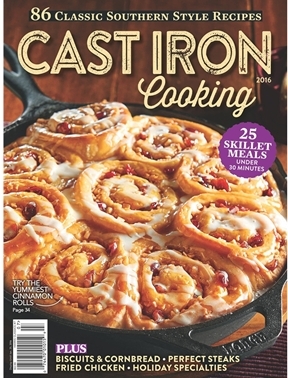 This premium magazine offers more than 90 Southern-inspired recipes including skillet breakfasts, yeast breads and biscuits, fried specialties for chicken and fish, seared steaks, pies and cakes. A bonus section offers prize-winning recipes from the National Cornbread Festival. Recipes come from the most respected Test Kitchens in America including the Beef Council, Alaska Seafood Marketing Association, and the National Chicken Council, as well as leading consumer companies such as Lodge Manufacturing, Kraft Foods, McCormick, Perdue, Tyson and King Arthur Flour. Every recipe includes a complete nutritional analysis, cooking times and detailed tips for cooking with cast-iron.